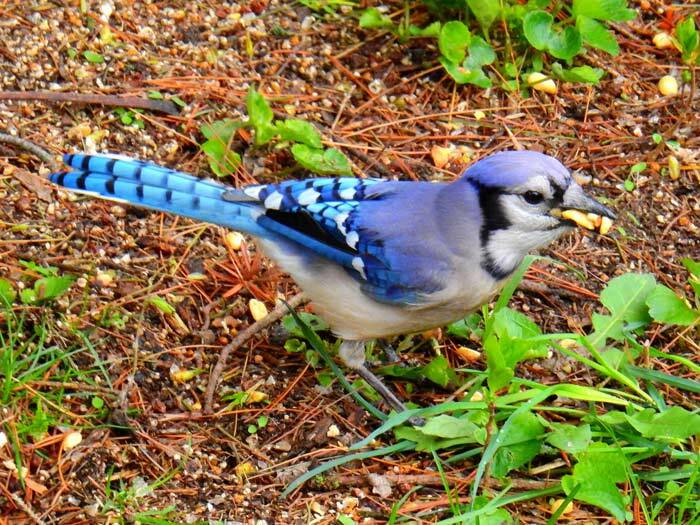 Blue jays eat nuts, such as acorns, berries and seeds, as well as small insects like caterpillars, grasshoppers and beetles. Blue jays store food in bark or soil to eat during winter when food may be scarce. The blue jay, sometimes called a jaybird, lives in deciduous and coniferous trees and eats the berries, seeds and nuts found in its habitat. Because of its strong black beak, it can eat hard-shelled nuts or occasionally eggs and nestlings. Blue jays are commonly found in residential areas and eat table scraps and bird feeder offerings, such as seeds and nuts. The blue jay is not an aggressive bird and is often dominated by other birds at the bird feeder.